Her atypical adolescence, spent surrounded by adults, quickly carried over into her songwriting, which is dominated by stories of impossible love. Though these sombre tales were initially fabricated, many of them materialized in Camille’s life over the years, throwing the singersongwriter into a state of inspired melancholy. Four songs were released on Bandcamp in 2014, and she soon gained attention for her spellbinding voice, with its distinctive, crystal-clear tone. KROY was then dubbed the “next Montreal indie pop sensation” by cultural magazine Voir. She opened for Coeur de pirate and AaRon, in addition to performing on various stages in Quebec, Europe, and the United States. Between Milk & Bone tours, Camille carries on her solo work influenced by spacey trip-hop (Goldfrapp, Portishead) and inventive modern pop (Vampire Weekend, Youth Lagoon). 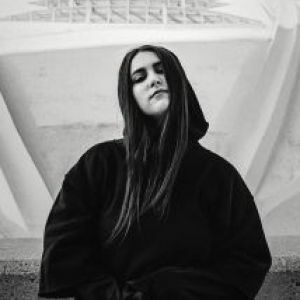 An “Artist to watch in 2016” according to Noisey, KROY released her first full-length album on September 23rd under Dare To Care Records. The recording proves to be more eclectic and personal than Camille’s previous work, reflecting her bold and brilliant pop explorations.